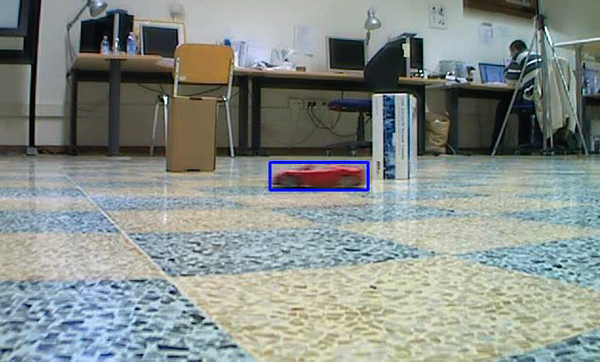 We propose a method for real time recovering from tracking failure in monocular localization and mapping with a Pan Tilt Zoom camera (PTZ). The method automatically detects and seamlessly recovers from tracking failure while preserving map integrity. By extending recent advances in the PTZ localization and mapping, the system can quickly and continuously resume tracking failures by determining the best way to task two different localization modalities. The trade-off involved when choosing between the two modalities is captured by maximizing the information expected to be extracted from the scene map. This is especially helpful in four main viewing condition: blurred frames, weak textured scene, not up to date map and occlusions due to sensor quantization or moving objects. Extensive tests show that the resulting system is able to recover from several different failures while zooming-in weak textured scene, all in real time. Dataset: we provide four sequences (Festival, Exhibition, Lab, Backyard) used for testing the recovery module for our AVSS 2011 publication, including the map, nearest neighbour keyframe of the map, calibration results (focal length and image to world homography) and finally a total of 2,376 annotated frames. The annotations are ground-truth feet position and head location, used to decide if the calibration is correct or not. Annotations are in term of MATLAB workspace files. Data was recorded using a PTZ Axis Q6032-E and a Sony SNC-RZ30 with a resolution of 320 x 240 pixel and a frame-rate of about 10 FPS. Dataset download. NN keyframe are described as a txt file where first number is the id of the frame and the next string is the id (filename of images in map dir) of the relative NN keyframe as #frame = keyframe id. Note that we store in the file only the frame number in which there is a keyframe switch. Calibration is provided as a CSV file using the following notation [#frames, h11,h12,h13,…., h31,h32 ,h33, focal length], where hij are the i-th row and j-th colum of homography. A MATLAB script is provided to superimpose ground-plane in the current image(plotGrid.m). The homograhy h11..h33 is the world to image homography that maps pixel into meters. Ground-Truth is under the name of “ground-truth.mat” and it consists of a cells where each item is the feet position and the head position. In each sequence it is present a main script plotGrid.m MATLAB script that plots ground-truth annotations and superimposes the ground-plane on the image. ScaleView.m is the script that exploits calibration to predict head location. Note that we have obfuscated most of the faces to keep anonymity. This entry was posted in Intelligent videosurveillance, Projects, Research projects and tagged localization, mapping, ptz-camera, tracking on May 11, 2011 by admin. 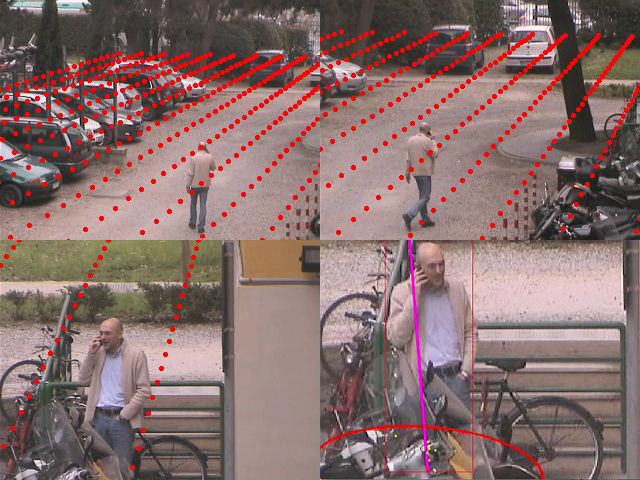 This research aims to realize a videosurveillance system for real-time 3D tracking of multiple people moving over an extended area, as seen from a rotating and zooming camera. 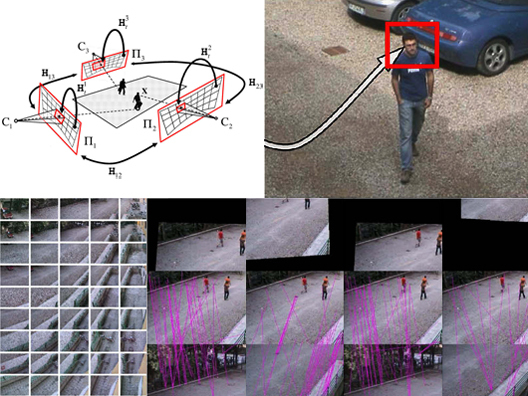 The proposed method exploits multi-view image matching techniques to obtain dynamic-calibration of the camera and track many ground targets simultaneously, by slewing the video sensor from target to target and zooming in and out as necessary. The image-to-world relation obtained with dynamic-calibration is further exploited to perform scale inference from focal length value, and to make robust tracking with scale invariant template matching and joint data-association techniques. We achieve an almost constant standard deviation error of less than 0.3 meters in recovering 3D trajectories of multiple moving targets, in an area of 70×15 meters. This general framework will serve as support for the future development of a sensor resource manager component that schedules camera pan, tilt, and zoom, supports kinematic tracking, multiple target tracks association, scene context modeling, confirmatory identification, and collateral damage avoidance and in general to enhance multiple target tracking in PTZ camera networks. This entry was posted in Intelligent videosurveillance, Projects, Research projects and tagged 3D tracking, ptz-camera, tracking, videosurveillance on July 14, 2010 by admin. The project’s goal is to develop a computationally efficient, robust real-time particle filter-based visual tracker. In particular, we aim to increase the robustness of the tracker when it is used in conjunction with weak (but computationally efficient) appearance model, such as color histograms. To achieve this goal, we have proposed an adaptive parameter estimation method that estimates the statistic parameters of the particle filter on-line, so that it is possible to increase or reduce the uncertainty in the filter depending on a measure of its performances (tracking quality). The method has proved to be effective in dramatically increasing the robustness of a particle filter-based tracker in situations that are usually critical for visual tracking, such as in presence of occlusions and highly erratic motion. The data set we used is now available for download, with ground truth data, in order to make it possible for other people to test their tracker on our data set and compare the performance. We have tested the performance of the resulting tracker on the sequences of our data set comparing the segmentation provided by the tracker with the ground truth data. Quantitative measures of this performance are reported in the literature. 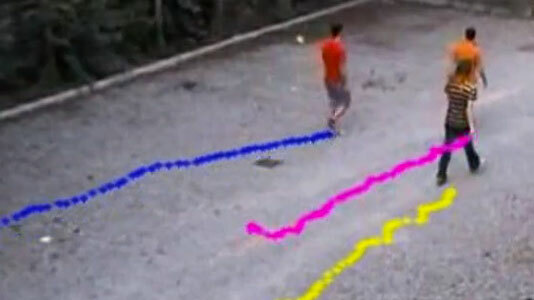 Below we show a few videos that demonstrate the tracker capabilities. This entry was posted in Intelligent videosurveillance, Projects, Research projects and tagged color histograms, erratic motion, occlusions, particle filter, ptz-camera, visual tracker on June 11, 2010 by admin. 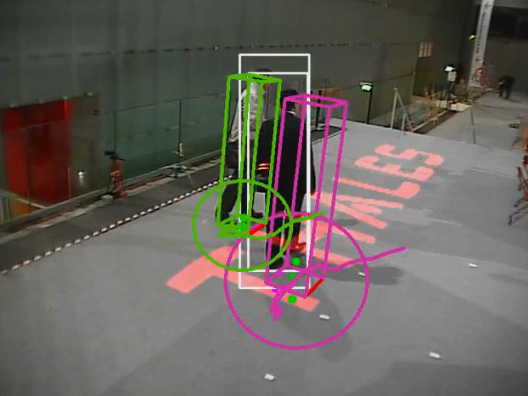 Localization and Mapping with a robotic PTZ sensor aims to perform camera pose estimation while maintaining update the map of a wide area. While this has previously been attempted by adapting SLAM algorithms, no explicit varying focal length estimation has been introduced before and other methods do not address the problem of being operative for a long period of time. In recent years, pan-tilt-zoom cameras are becoming increasingly common, especially for use as surveillance devices in large areas. Despite its widespread usage, there are still issues yet to be resolved regarding their effective exploitation for scene understanding at a distance. 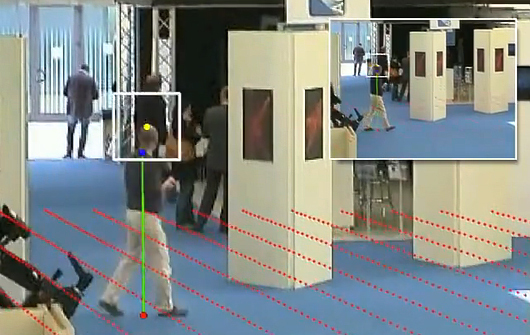 A typical operating scenario is that of abnormal behavior detection which requires both simultaneous target 3D trajectories analysis and the indispensable image resolution to perform target biometric recognition. This cannot generally be achieved with a single stationary camera mainly because of the limited field of view and poor resolution with respect to scene depth. This will be crucial for the challenging task of managing the sensor to track/detect/recognize several targets at high resolution in 3D. In fact, similarly to the human visual system, this can be obtained slewing the video sensor from target to target and zooming in and out as necessary. This challenging problem however has been largely neglected mostly because of the absence of reliable and robust approaches for PTZ camera localization and mapping with 3D tracking of targets as well. To this end we are interested in the acquisition and maintenance of an estimate of the camera zoom and orientation, relative to some geometric 3D representation of its surroundings, as the sensor performs pan-tilt and zoom operations over time. This entry was posted in Intelligent videosurveillance, Projects, Research projects and tagged localization, mapping, ptz-camera, videosurveillance on March 25, 2010 by admin.